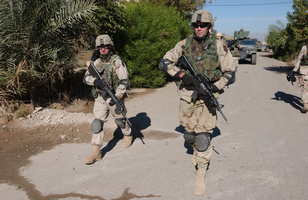 1 The war in Iraq began in March 2003. The United States had many reasons to attack Iraq. It believed that Iraq was making and storing weapons. These weapons could hurt many, many people. It believed Iraq was breaking rules set by the United Nations (U. N.). It also believed that Iraq's government was helping terrorists. President Bush thought that Iraq might give weapons to terrorists. He thought Iraq or these terrorists might use weapons in the United States against our citizens. 2 The ruler of Iraq, Saddam Hussein, had been cruel. He used bombs against one group of Iraqi citizens. Thousands of innocent people died. Saddam Hussein lived in luxury. He built forty new palaces for himself and his family. He did this while many of his people were poor and starving. 3 President Bush wanted the U.N. to support attacking Iraq. The U.N. Security Council's job is to keep world peace and safety. It has five permanent members. They are the United States, Great Britain, Russia, France, and China. Only Great Britain supported the U.S. war on Iraq. Russia, France, and China all believed that a peaceful solution should be found. 4 The U.S. attacked Iraq on March 20, 2003. Great Britain, Australia, and Poland sent troops, too. These countries are called allies of the United States. Bagdad, the capital city, was captured on April 9. By May 1, President Bush declared that the war was over. But fighting in Iraq continued.